If you frequently upload videos to YouTube and make them private, if you use the "Creative Commons Attribution" license for most of your videos, if many of your videos have the same tags, similar descriptions or you're picking the same category, now you can adjust the default upload settings from this page. You can also find the page by clicking "Defaults" in the left sidebar of the settings page. 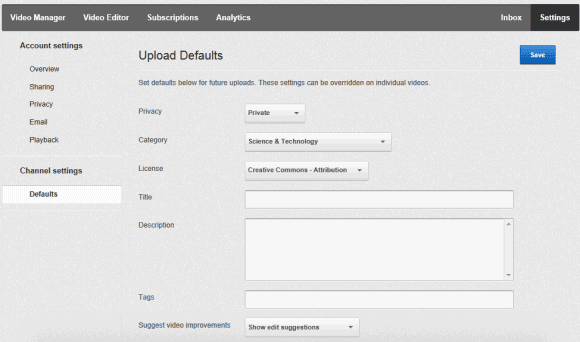 When you're uploading new videos, your custom settings show up. As YouTube informs, "these settings can be overridden on individual videos." When i click on http://www.youtube.com/account_defaults it doesn't load, when I go to the accounts page, there is no default tab. Two accounts, in neither can I get access. Try again later. Maybe the feature is not yet available to everyone. You could also clear the cookies for youtube.com. That's what I assumed when I didn't see a default tab either.